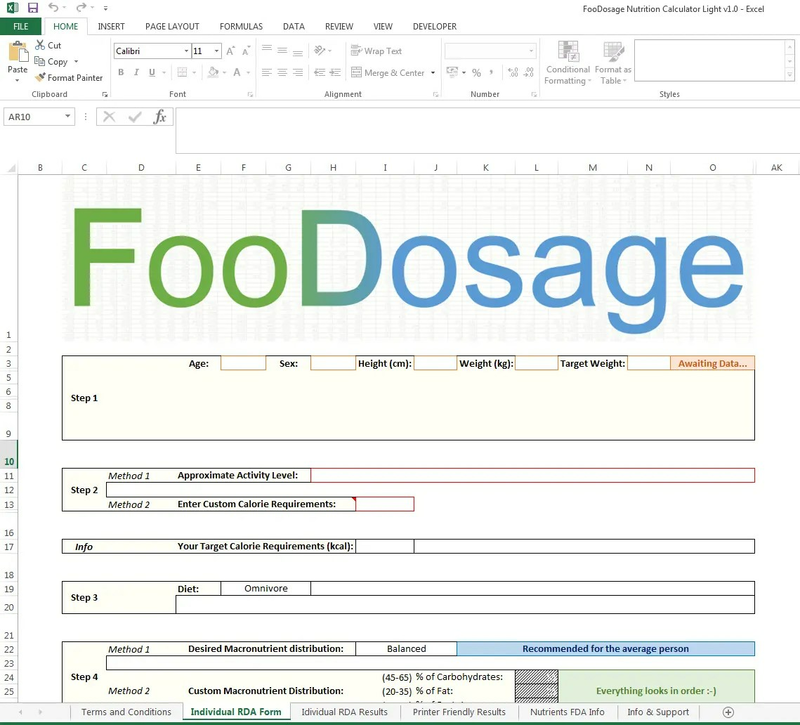 The FooDosage Nutrition Calculator is an Excel based tool that enables you to figure out your own individual minimum, target, and maximum values for all the major nutrients, as well as analyze recipes and plan your personalized optimal diet. (Based largely on USDA food data and National Academy of Sciences recommendations). Because of the comparatively small size (and fewer relative formulas), this should run much faster than the full version, and if you’re just looking for the RDA calculator, this is the version you want. Requires: Microsoft Excel, or a program that can open Excel files. 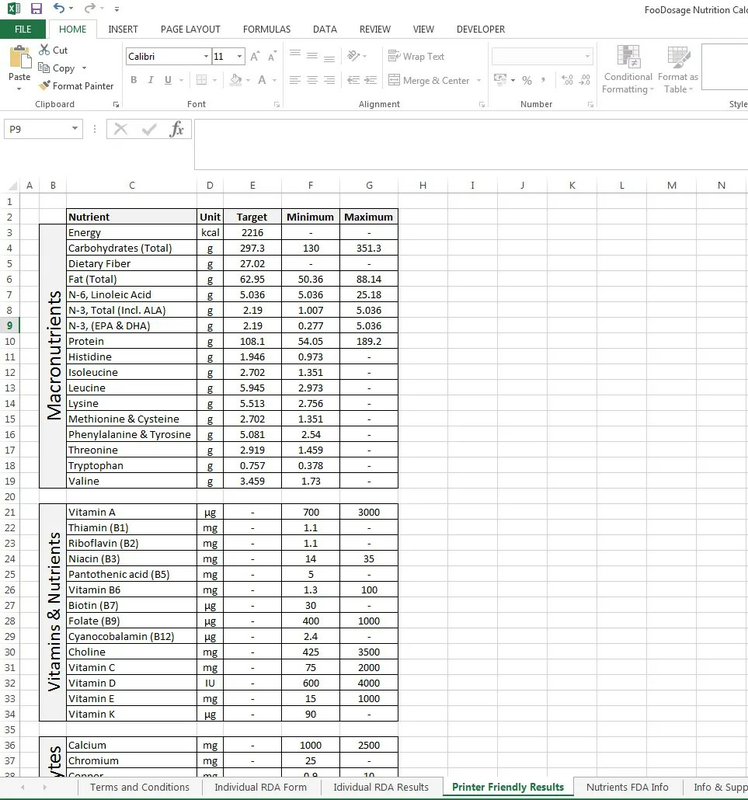 Developed on, and optimized for: Microsoft Excel 2013 for Windows. Note that on different versions, there might be bugs such as missing formatting options or formulas. This is the version I am using myself, both for my personal nutrition as well as for foodosage.com articles. Unfortunately, due to the limitations of Excel, it is not exactly user friendly and requires a lot of processing power. Still, the reason I made it is the reason I’m using it: I was not completely happy with the scope of information/features I could find online (in one place). I hope to be able to produce a dedicated piece of software that will combine the features of the current full version with a user friendly UI and optimized resource requirements, plus some online functionality and/or a website integration. Until then, this is my nutrition calculator of choice. And maybe it will become yours. Step 1: Fill in all the fields. You can choose between centimeters and inches, and kilograms and pounds from the drop down menus in the “Height” and “Weight” text boxes. Step 2: Either choose an approximate activity level, or enter a precise calorie amount. The latter method is useful if you already know your calorie requirements. If you enter a custom amount, this will override the drop down selection. Step 3: Choose your diet. Step 4: Choose your desired Macronutrient distribution. This will determine the target values for Protein, Fat, and Carbohydrates. To enter your own percentage values, choose “Custom” and enter them in the fields below. Step 5: Make individual Adjustments: If you know you need more or less of a certain nutrient than the average person, you can adjust the factor of the recommended amounts here. 200% means double the average amount, 300% three times as much, etc. These results are used for the other functions of the calculator’s full version. Use the Diet Evaluator to identify weak spots in your current diet, or to plan your perfect diet from the ground up, based on your Individual RDA Results. Step 1: Find the number of the food you want to add to the list. To do this, navigate to the page “Food List”, open the sort and filter menu in the cell “Description” (C1) and type & select the food item you are looking for. In the example below, cottage cheese. 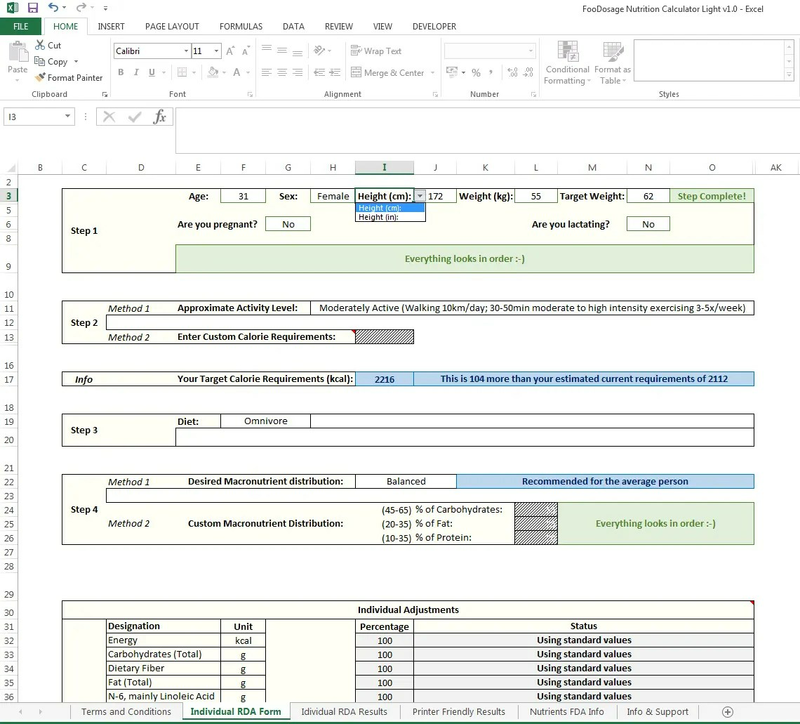 Now, copy the number in column A, switch back to the Diet Evaluator sheet, and paste it into the corresponding field (Column B). Step 2: Enter the amount of the food you ate, or plan to eat in column D. You may change the units from grams by opening the drop down selection in column E. Note that grams and ounces are always an option, while other measurements like cups and tablespoons have not been recorded for every food item. As a rule of thumb, if it is usually measured in cups, cups should be available. The calculator will notify you if the chosen unit of measurement is not available for the chosen food. Step 3: Repeat until all food items for that day have been entered. Don’t forget such details as the spoon of sugar in your morning coffee. ..or from a bit further away.. Some nutrients, namely water soluble vitamins like vitamin C, should be taken in adequate amounts daily, while the recommended levels of others such as fat soluble vitamins and minerals can be calculated as a weekly average. Don’t panic if you don’t meet your Vitamin E goals one day, or if you get too much vitamin K the next. if it balances throughout the week, you should be just fine. (The liver stores excess fat soluble nutrients until needed. If an excess is consumed on average, the corresponding dangers of overconsumption become relevant). This is where the weekly Diet Evaluator comes in. You can save recipes to use them in the Diet Evaluator. This could be your own famous homemade apple pie, or it could just be the amount of milk and sugar in your morning coffee, so you don’t have to enter those separately for each and every day. Step 1: Fill in the form in the same fashion as with the daily Diet Evaluator. Step 2: At the bottom of the form (D54), you have the option of entering the correct total weight, should the preparation of the ingredients have changed their raw total weight. This is very relevant to the “Per 100g” values. If the field is left blank, the ingredients’ total weight will be used for calculation. Step 3: Copy the “Per 100g” values. The easiest way to do this is to select cell Z55 and press ctrl + shift + right arrow (to select all relevant cells), then ctrl+c. Step 4: Paste the copied cells into the “Saved Recipes” Area. Select the first cell of the first empty line, in this case Z66, and “paste as values”. Is your favorite power bar not in the food list? Do know the nutrient profile? Great, let’s add it! 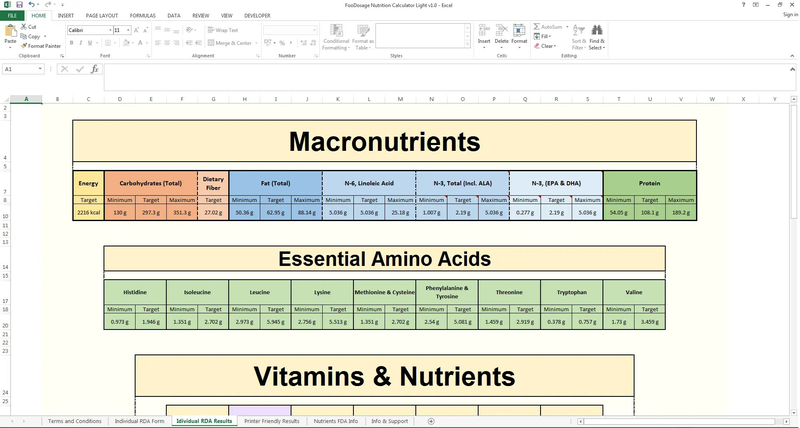 Step 1: Fill in the description field and nutrient values.